Jose Mourinho never misses an opportunity to take a jibe at Pep Guardiola, but the Spanish manager’s demeanour is what one can learn from. Later in the same speech he went on to detail his exploits with Porto, Chelsea, Inter Milan, Real Madrid and Chelsea again. After Barcelona Messi-merized Bayern at Camp Nou with a 3-0 win, Mourinho followed up with another jibe at Guardiola and Barcelona in a thinly-veiled attempt to praise Lionel Messi. Later, in the same speech, he went on to detail how he has been successful in stopping Messi as coach of Inter Milan and Real Madrid. Two jibes within the same fortnight, two times announcing his achievements; during Pep Guardiola’s worst week of the season. Was the criticism of Guardiola justified? The English media meanwhile went ballistic on how Pep Guardiola had weakened Bayern Munich with his tactics and how the German team could do with a bit of Mourinho’s school of thought. The prime concern being that Pep started the Camp Nou semi-final encounter with only three defenders at that back. What mainstream media conveniently overlooked is that the three-man defence had been re-jigged to a four, within 15 minutes into the game. That aside, Bayern went into that game with four starting players injured and their leading striker playing with a face mask. They held on for 77 minutes until Messi, Dani Alves, Luis Suarez, Ivan Rakitic and Neymar wreaked havoc. At the time of writing this, Barcelona’s record in all competitions read: played 30, won 27. Fitter, stronger, more varied than ever; Their aggregate score over the last eight games read: 27-3. They are in the Copa del Rey final, Champions League final and one win (out of two games) from winning their seventh La Liga title in 11 years! Contrast Pep’s exit to how Jose Mourinho’s team went out of the Champions league this season at the Round of 16 stage. Chelsea were playing at home at Stamford Bridge, lead the encounter twice, had a man advantage for over 80% of the game and lost to routine set pieces against a team who didn’t have any Messi amongst them – PSG. Yet, the criticism on Mourinho was far lesser than what Guardiola has been subjected to. On the other hand, the praise in general for Mourinho has also been far lesser than he deserves. He has been overlooked this entire season for the Manager of the Month award. His constant jibes at ex-players, referees, representatives of the FA, Premier League and League Managers Association does his case no good. The constant bickering and ugliness he generated at El Clasicos during his stint at the Bernabeau doesn’t give fond memories to anyone in Spain either. Since he left, El Clasicos are more about goals than red cards or eye pokes. 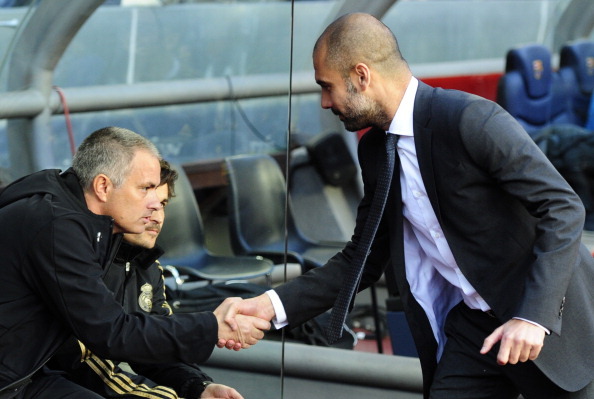 Pep Guardiola, meanwhile, carries one of the best images as a manager. His stoic silent stance in the face of all such jibes (barring one breakdown at the Bernabeau press box in 2011) or on field reverses, does his reputation a lot of good. Zlatan Ibrahimovic has used every possible opportunity to mock Guardiola and Barcelona, even to sensationalize his book in 2013 and sell copies. The Camp Nou maintained silence. Time surfaced the demerits in Zlatan’s accusations. For long he blamed how Barcelona was controlled by Messi, that the Argentinean wanted to play in a central role and had Zlatan pushed to the wings. In late 2014, the world saw how Leo Messi asked Luis Suarez (still finding his feet with the Catalans) to play centrally while he played on the wings, as that would benefit both Suarez and the team. Similarly, Zlatan’s accusations against Pep have missed a basic underlying point – that Pep wanted him so badly that he made the club shelve an obscene amount of money and frontman Samuel Eto’o in exchange for the then Inter Milan hitman. Pep had Zlatan in his dream team. Zlatan just needed to put the team ahead of himself. He was less of the victim and more of the culprit, but Pep kept silent. Guardiola has a thing or two to learn about defensive organization from Mourinho, but the latter has a lot to learn from Pep. Next Next post: Movie Review: Tanu Weds Manu Returns – With A Bang!